At yesterday’s tan suit presser, President Obama said a whole lot of nothing. After informing our ISIS enemies that he has no idea what he’s going to do about them – if anything – he turned his attention to Russia. It’s should be obvious to every clear-thinking man, woman, and child that, if over a thousand troops, tanks, and paratroopers drop into a foreign nation, it’s being invaded. Unfortunately, it seems that it’s not obvious to Barack Obama. …Because the word “invasion” has magically disappeared from his vocabulary. So why can’t Barack Obama bring himself to utter the “I-word?” Most media outlets are looking for a geo-political reason, but you don’t need to work that hard. If there’s one thing we know about Barack Obama, it’s that – for him – everything is about Barack Obama. The nation, the world, and the very fabric of the known universe revolve around his visage. So I have a theory about why he’s so reticent to call this an invasion: Sarah Palin. 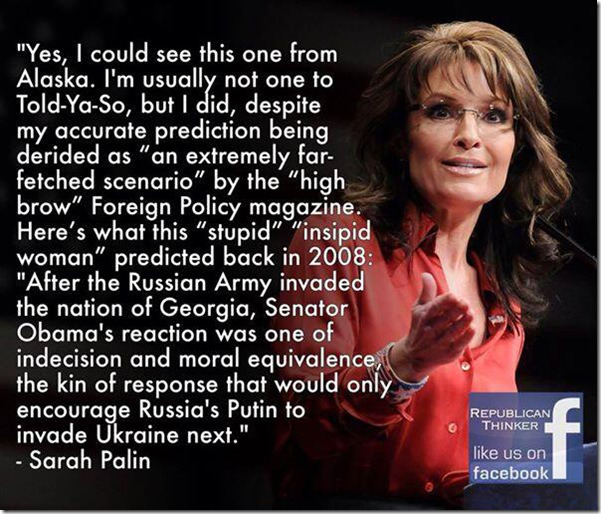 Back in 2008, Sarah Palin warned the world that, if the United States elected a weak-minded equivocator like Senator Barack Obama as its next President, it would embolden Vladimir Putin and spark an invasion of Ukraine. She was, as you’ll certainly recall, lampooned endlessly for the assertion. This is where the infamous “I can see Russia from my house” bit on SNL came from. Now, it turns out that her prognostication was 100%, dead-on, correct. Not only did she nail the countries involved, but she also stuck the landing by predicting the reason. Putin doesn’t care what the rest of the world thinks, and he has no reason to concern himself with Obama, because Obama has projected nothing but abject weakness. Sarah Palin was “right” with a specificity rarely seen in politics and the left spent six years mocking her mercilessly for it. To admit that the “stupidest woman on the face of the Earth” was correct all along would not only be an embarrassment, it would be anathema to every single thing for which the modern Democrat party stands: namely ego, arrogance, and agenda. For them, Palin is public enemy number one. She is the embodiment of everything they despise and a six-year focal point for their unhinged rage. She can NEVER be allowed to be proven right. She said Putin would invade Ukraine, so there is no invasion of Ukraine. Is it petty? Yes. Is it a childish? Sure. Is it everything we’ve come to expect from the petty man currently occupying the Oval Office? This entry was posted in Barack Obama, Ferguson, Palin, Sarah Palin and tagged @sarahpalinusa, Alaska, Barack Obama, Canada Free Press, Clinton, CNN, Drudge, Faux News, Hillary 2016, Hillary Clinton, iphone6, ISIL, Islam, Joan Rivers, NY Times, palin SMASH, Ready for Hillary, Redskins, Russia, Sarah Palin, sarah palin channel, Tea Party, Ukraine, Unite Blue, Veterans. Bookmark the permalink.